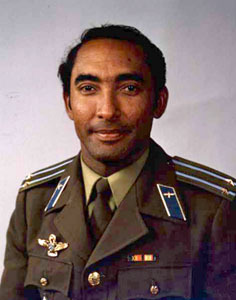 The first person of African descent to go into space, Arnaldo Tamayo Mendez was also the first (and to date, only) Cuban to leave the warm Caribbean for the desolate cold of near-earth orbit. On 18 September 1980, Tamayo launched as a crewmember aboard the Soviet space programme's Soyuz 38 for an eight-day visit to the Salyut 6 space station. He was the second non-Warsaw Pact and the second "third world" cosmonaut. His mission package included growing organic monocrystals in space using Cuban sugar. Tamayo's commander on the Soyuz 38 flight was Yuri Romanenko. In 2005, Tamayo is one of the candidates to represent the municipality of Guantánamo in the April elections. Arnaldo Tamayo Mendez was born January 29, 1942.